Every person alive today has a guide. No one walks alone. We might feel we do, but we all have a guide with us. Guides are usually with us because of family, past life and karmic links. There are several types of guides and they all have different functions. There are the guides with whom we have family ties. They are there to help us within the context of our family relationships. Then there are the past life and karmic guides. They step forward to be our guides because of relationships in a past life and karmic links. They are there to help with personality, emotional and mental issues, such as anger, self-faith or any of those countless issues we never resolve life after life. Then there are the higher spiritual teacher guides. These higher guides still need to come back into body, they are still on the cycle of rebirth, but they are old souls and are drawn to act as teachers. Higher guides come and go. They rarely stay a life time with one person though it is not impossible. They are there to work with our life lessons and spiritual development. Guides are still on the cycle of rebirth - Ascended Masters are not, karma no longer draws the Masters back into body. They have ascended. Guides have not ascended. The Ascended Masters are here for one reason and one reason only - to help humanity in their ascension process. Ascended Masters have walked the path of Ascension and still do. Their service is to help humanity with their ascension process. Ascension is the raising of our vibration and therefore our consciousness. We raise our vibration by releasing our dross and paying our karma. In the past only those old souls had an ascended Master with them. This is no longer the case. These are the times of ascension and everyone has Ascended Masters with them. 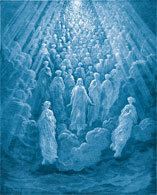 Prior to incarnation you are assigned a team of angels and Masters. We all incarnate of 5 rays of incarnation. The Ascension (soul) ray, Life (personality ray), mental body ray, emotional body ray and physical body ray. With each of these rays we are assigned a Master. So we can have 5 different Masters with us. The two most important are the Ascension Master who helps with our ascension and the Life Master who is there for the issues and lessons that arise for this life. Also some of you have heart connections with the Masters from previous lives. Your soul remembers this and calls and brings the Masters in close regardless if the Master is one of your team. A good example of this is Jesus, Mother Mary and Buddha. Many have had lives as devotees -nuns, monks, priests - in which lives have been devoted in worship and adoration to one particular Master. The soul remembers this and once in body again, the soul calls to the Master. This heart connection brings the Master in closer, regardless of the ray the person incarnates on or the team assigned to them. This heart connection from previous lives often causes the person to reject their current teacher, allowing no heart connection in this life to be formed. But remember, ascension is about becoming your own Master; it's about the ascension into your own Christ. When you are ready to start the Ascension into your own Christ, that's when your ascension Master will make greater efforts to be acknowledged. Having walked the path you are now walking, they are ready to show you the way. There a thousands upon thousands of Masters who have ascended, but few are teachers. Your Master is chosen for you because they are best suited to assist in your Ascension process. Here is a link to an article on the 42 Ascension Masters.